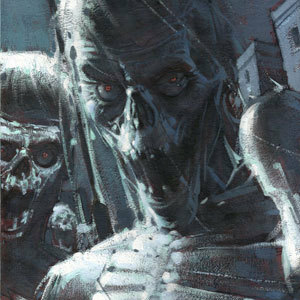 Following the sold-out exhibit, The Art of the Walking Dead by John Watkiss, Nucleus is pleased to announce that additional concept art created for the series is now available from the prolific artist. These new arrivals will be made available online to collectors on April 21, 2013. Please inquire using the form to the right. There will not be a physical exhibit in tandem. Below is information regarding the initial exhibit which was on display at Nucleus from November 17 through December 11, 2012. The television series, The Walking Dead, tells the story of a small group of survivors living in the aftermath of a zombie apocalypse. The group struggles to balance their humanity with their survival against the zombie horde. Nucleus presents a collection of concept art developed for the television series by acclaimed artist, John Watkiss. Each original drawing or painting created by the artist served as reference for the film crew to pre-visualize film sequences, action, and camera angles. This is a rare opportunity to own an important piece of the hit television series. With notable academic accomplishments, John Watkiss began his career in London as a portrait painter and illustrator as well as teaching anatomy and fine art at the Royal College of Art and Spielberg’s Amblimation. The artist has collaborated with numerous high profile studios on projects including Tarzan, Atlantis, Sky Captain and the World of Tomorrow, and Sherlock Holmes. Watkiss’ work has been featured in the British National Portrait Gallery and The Ford Motor Company Museum. If you have questions about this show, would like to be added to the preview list, or would like to be notified about specific artists, please send us a message using the form below. Please update me on new products, upcoming events, and exclusive discounts via the Nucleus email newsletter.